A resident says the city is making it easy for anyone to surveil people, their cars and their kids. It’s widely known, especially since 9/11, that surveillance cameras are everywhere. Many Bay Area police departments use a network of security cameras to keep the public safe. But the use of surveillance technology is coming to a head in Orinda where one vocal critic says public cameras are violating privacy rights of residents and people who visit the small East Bay city. He also contends that their use is fraught with potential danger because they provide a way for someone to amass license plate numbers of cars caught on camera, which he says can be used to track people. The Orinda Police Department began installing 16 Reconyx brand portable surveillance cameras at public intersections starting last July. The city hasn’t disclosed the locations of the cameras, but they are easy to spot. They look like little gray boxes, and they’re attached to stop signs and traffic poles. The Investigative Unit found cameras at major intersections and residential streets. 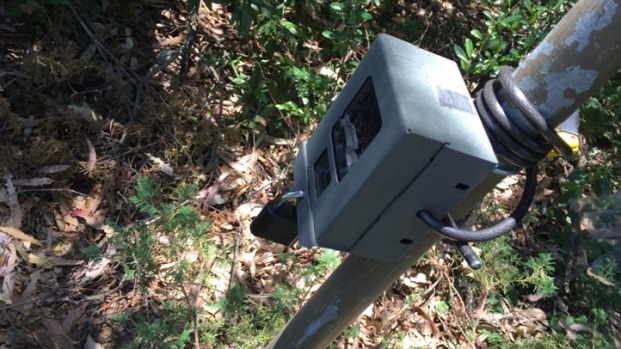 Several other East Bay cities, including nearby Lafayette and Danville use the Reconyx cameras, too. The cameras are intended to assist law enforcement by capturing images of fleeing thieves. But since the cameras are motion activated, they snap pictures of anything in their path. That includes joggers, dog-walkers, and schoolchildren. Orinda has 16 surveillance like this one on public streets and intersections. According to Orinda’s policy, the photos captured by the cameras are considered public records accessible upon request. That means someone can obtain a cache of pictures of people going about their daily routines. A request for photos submitted by the Investigative Unit produced 5.7 million pictures covering a 90 day period – the length of time the city maintains the records. 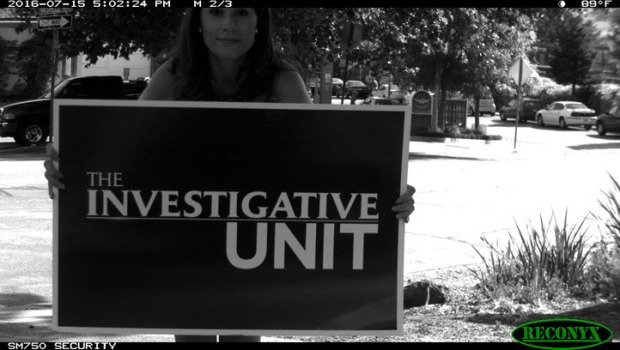 Orinda’s surveillance cameras caught the Investigative Unit on a public street. That volume is staggering to some, including Orinda resident, Jack Paulus. He says because the photos are date and time-stamped, anyone can click through the photos to determine when and how children walk to school, for instance. What’s more alarming, Paulus says, is that anyone can apply computer software to the photos to search for cars and determine when they’re caught on camera. He says it allows someone to determine a person’s travel patterns. He calls the photos “dangerous information” to release to the public. The Electronic Frontier Foundation, a San Francisco-based privacy advocacy organization that opposes mass surveillance, believes the public should be worried about the use of cameras in cities across the Bay Area. Senior attorney Adam Schwartz acknowledges the importance of access to government records, but not at the expense of people’s privacy. Orinda Police Chief Mark Nagel disagrees that the cameras jeopardize privacy because he says they only capture photos in public places. He says the cameras are critical crime fighting tools in his community, which has been rocked by a wave of residential break-ins. A picture of a white Lexus led to the arrest of an 18-year-old man who pistol-whipped a woman and ransacked a house last December. According to Nagel, earlier this year the cameras linked a prolific residential burglar to a home that was hit, which allowed police to add charges and bring resolution to the victim. Nagel says the solve rate increased from 5 percent to 25 percent after the city installed the cameras. Crime data analyzed by the Investigative Unit shows residential burglaries decreased by 54 percent in the 11 months after the Reconyx cameras became operational compared to the 11 months prior. “I think the value of the cameras being in the community for safety and solving crimes is really necessary to keep our numbers low,” Nagel said. Many residents like the extra set of eyes over their city. Elisabeth Jewel says people feel like they have “targets on their backs” and that many nervous residents support the use of the cameras to deter would-be burglars. Other Bay Area police departments use surveillance cameras, but the type of technology and public disclosure polices vary, the Investigative Unit found. Danville uses Reconyx cameras, and like Orinda, the city releases copies of images upon request. Lafayette uses them, too. But the city does not consider the pictures to be public records. Here is a sample of other Bay Area communities that use surveillance cameras. Like Orinda, some cities allow the release of images and footage under their public records policies. Antioch, Pittsburg and Palo Alto say depending on the circumstances, photos and video may be released in response to public records requests. Richmond refuses to release pictures or footage. Using the pictures he obtained from the city of Orinda, and a free computer program he downloaded, Paulus says he created a way to search for license plate numbers. He says his system is similar to controversial automated license plate reader (ALPR) technology widely used by law enforcement in Northern California. These plate readers are small machines mounted to squad cars and street poles that scan license plates and log when and where a vehicle is spotted. Police use the technology to identify cars connected to crimes, but critics say the system also collects information about innocent people. NBC Bay Area confirmed that his system worked. With the police chief’s permission, the Investigative Unit used a computer program to locate a picture of an Orinda Police car by searching the system for its license plate. Nagel acknowledges that it’s possible to convert photos of license plates into a searchable database, but downplayed the relevance of being able to pinpoint when someone’s car was caught on camera. Several residents have proposed ways to add protections to the Reconyx photos, such as encryption, so only law enforcement would have the ability to view the images. Nagel says he is open to reducing the amount of time the city retains the photos. Currently, the pictures are deleted after 90 days. As more police departments contemplate the installation of surveillance technology in their cities, Paulus encourages residents to get educated and be vocal.